I'm looking at buying a new PC so my question is can Rome 2 be played on the windows 10 operating system? Yes, what do you think we are playing at? Win95? [QUOTE=Daruwind;15758471]Yes, what do you think we are playing at? Win95? Well put it this way if I attempted to install Quarkxpress 6.1 or Photoshop CS I would have a problem as the new operating system isn't built for these old programs and Rome 2 is exactly a new game. I can remember when it came out a lot of gamers were having problems with graphics etc. on their new systems! That's why I asked? Yes, you may obviously ran R2 on Windows 10, though I believe Windows 7 is actually a more stable alternative. I'm playing R2 on Windows 10 and I used to have a coupld of issues related to Windows automatic updates that would just break the game and that I had to roll back to put things back in order. Though, I think the issue was more Steam-related, rather than specifically Rome 2-related. Other than that, I haven't really experienced any problems. yeap, just go for it...no big issues since the first big patch. Yo should be careful with the various small updates though, because some of them are usually a bit bugged at the beginning, but you can install-unistall them on the fly anyway, so not a big issue. Windows 7 will get Directx12 support though, if you don't want to take the Win10 jump. 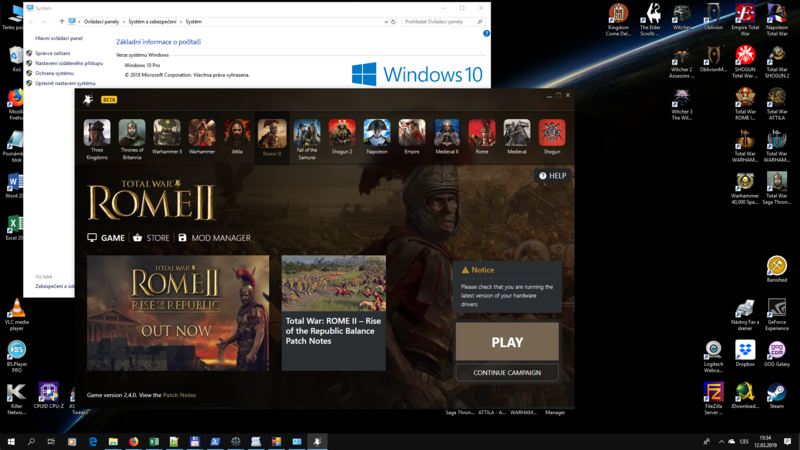 I had some issues initially playing Rome II with Windows 10. I reported the solutions which worked for me here and here. NVIDIA's drivers had issues during the first half of 2018, indeed. The most serious one was the Control Panel's complete disappearance, but AFAIK these issues were connected to Win 10 latest fixes. I solved it pretty easily though, by finding the culprit in the Update and disabling it. Or try to delete Rome II > launcher folder. Steam will download then at next start a new fresh one. Thanks for the tips, but neither the reverting launcher to old one (and vica-versa), nor deleting launcher folder didn't worked. 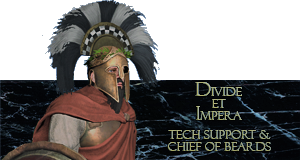 If you have deleted mods and it still doesn't work, search for %appdata%\The Creative Assembly\Rome II. Delete complete Rome II folder, steam will reload. Last edited by Clodia_Metelli; April 14, 2019 at 07:24 AM. 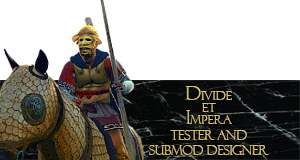 It was already mentioned and I deleted - to note: I've never used any kind of mods to Rome II. Yesterday I made a fresh install (deleted the game, all remaining folders, registry entries through cleaners, reboot, and then fresh download) and the game still doesn't work. I cant belive that I have an original, supported software (collectors edition btw.) and not working on the prescribed hadrware / OS. I have at times experienced problems related to the graphics card drivers. Have you had any automatic updates lately? You may try to revert to some previous driver of your card and see if that solves the problem. I have the suspicion.... (but I didnt want to imagine this issue - a 2013 windows 8 compatible year game have a graphics card driver problem, is it possible?!) - recently (after aYear, I just updated my gfx driver). Thanks nVidia, thanks CA. Last edited by ♔Greek Strategos♔; April 22, 2019 at 12:04 PM. Reason: Merged posts. That was basically just a suggestion as I've myself experienced problems with the Nvidia drivers. You don't normally have to roll back as far as 2017, just try, for example, the driver previous to the one you currently have. That is done, and today I tried the basic driver from my gfx card CD (I used my optical drive 3 years ago?! ) - DO NOT WORK! I have an AMD-laptop, with Rome2 installation, I copied the Rome" folder to the Desktop Pc, but the trouble is the same.